Flip's Adventure was created by the Singapore division of the already famous Digipen University, a place where great free games are being made all the time. In this example, we have a nice single player platformer set in a steampunk universe, where a war between humans and alien robots is raging. 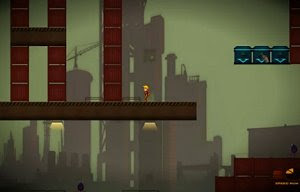 The player is Flip, who has to infiltrate the enemy base and install a virus, as well as discovering his true identity along the way. There are twenty levels to explore and many enemies to fight. The game includes an original multilayer function, with the chance of bringing the background area to the foreground by pressing the adequate switches. Although not revolutionary, Flip's Adventure is another successful creation from Digipen students, offering some solid gameplay and smooth visuals that will entertain players for a while.